Oh, the chickpea: it is such a modest and unassuming legume, when it deserves, in fact, to be among the vainest of all foods. The little sandy-colored sphere, also known as the garbanzo bean, is arguably the bean of all beans. I say this because its sheer versatility simply cannot be rivaled by any other bean. The chickpea finds itself at the heart of many meals and in a variety of forms: simmered into a fragrant curry, tumbled into a garden salad, ground and molded into a ball of falafel, or pureed with tahini into a creamy hummus, to name just a few. The discovery of this flour opened a veritable labyrinth of culinary doors for me, and I would be remiss not to share them. Chickpea flour can be found at health food stores, Middle Eastern and Indian markets, and even ordered online through Amazon. While it has yet to be incorporated into the common vocabulary of those in the United States, it has long been a staple of many traditional cuisines, ranging from Indian to Burmese to Southern European. Chickpea flour is packed with fiber and protein, and is an especially welcome addition to the pantry of those who are vegan or avoiding gluten. Below, I share my three favorite uses for chickpea flour. Panelle is a sort of “chickpea fritter,” a popular deep-fried street food in Sicily and also in Southern France, where it is known as panisse. It requires minimal ingredients and is, like all good things in life, wonderfully simple to make. The batter essentially consists of chickpea flour, water, salt, and whatever spices or herbs one prefers. The cooking method involves stirring the batter on the stovetop until it becomes thick and porridge-like, then pouring the batter into a rectangular pan to cool and firm up in the fridge. Once this is complete, all that’s left is to slice and fry it. Oftentimes, I slice the firm mixture into “matchsticks” for a new spin on French fries. They are delicious dipped into marinara sauce or pesto. In Sicily, especially Palermo, panelle is often eaten stuffed between two slices of soft country bread. This recipe from Italy Magazine incorporates fresh parsley into the batter. Not a bad idea. 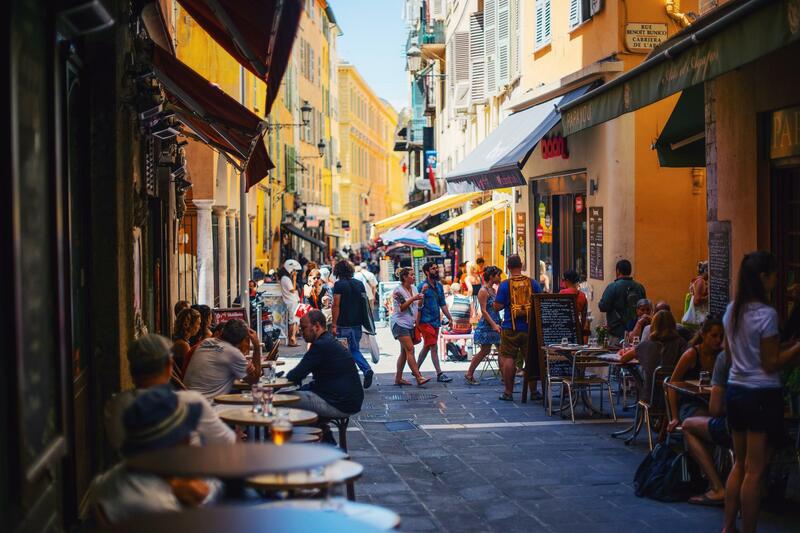 Envision yourself along the beaches of Nice, fingers curled around the stem of a glass of rosé, ensconced in bright hues not unlike those of a Matisse painting. What are you eating? Perhaps a refreshing salad Nicoise, or a generous helping of ratatouille? Non! You are eating a slice of sizzling socca, served hot off its copper pan. 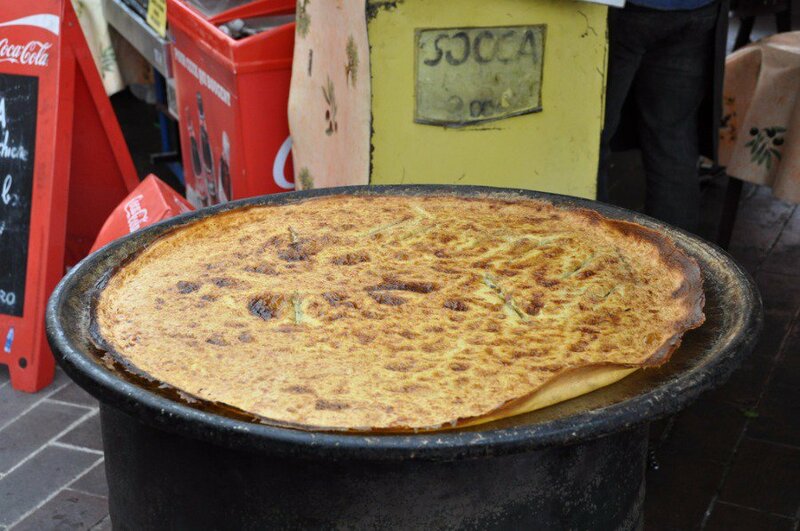 Socca is a thin pancake, essentially a savory crêpe, that originated in Genoa, Italy, where it is known as farinata. It later became popular along the Ligurian Coast, especially in cities such as Nice, France, where it is known as socca. Socca is a popular street food in these cities, where it is cooked over a wood-fire, thus developing a beautifully blistered crust and a slightly smoky undertone. It is cooked as a large pancake, sliced immediately, and eaten with a good olive oil and freshly ground black pepper. Like panelle, socca requires minimal ingredients. In fact, the only ingredient that really distinguishes one from the other is addition of cumin when making socca at home. This will give it the subtle smokiness that renders it as close to authentic as possible. The most difficult part of socca, and the main aspect that sets it apart from panelle, is the method in which it is cooked: the whole idea is to mimic the “wood-fired” effect, as seen in Nice or Genoa. Fortunately, one can come very close to the traditional taste and texture of socca by pouring the batter into a piping hot cast iron skillet and broiling it in the oven. Socca can be eaten simply, dipped into nothing more than a nice olive oil. Or it can be used as a thin base for pizza. I have been known to smear it with my go-to tahini sauce, a combination of tahini paste, lemon juice, salt, dill, and water. David Lebovitz offers a fool-proof recipe for socca, so I will let him take it from here. Chickpea flour has been heralded for its “eggy” quality, lending itself nicely to egg-free renditions of crêpes, omelets, and, yes, even quiche. Before I cook Clotilde’s quiche filling on the stovetop, I sauté shallots and mushrooms in some olive oil until softened, and then set the mixture aside. I do this before I cook the quiche filling because the batter must be stirred constantly, so it is best to give it your full attention. After the quiche filling is made, I stir in my shallot/mushroom mixture, followed by a handful of finely chopped dark greens, usually spinach or kale. My last addition, before pouring the whole mixture into the tart pan, is the ingredient that takes the dish over-the-top: tarragon. The addition of finely chopped, fresh tarragon brings this quiche to a whole new level, and the flavor and consistency of the finished product lands it somewhere between a quiche and a pot pie. Chickpea flour can be quite dense, so the outcome is not as light and fluffy as a quiche made with eggs, but I appreciate this fact: it makes for a hearty meal, which can be enjoyed warm or at room temperature. Try it paired with a simple green salad, or with haricots verts sautéed in a good olive oil and topped with slivered almonds.